Here's a brief bio that I send to people who ask me for one. You can also use the photo above (taken in 2002; it links to the original at 1600x1200). 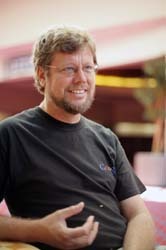 Guido van Rossum is the creator of Python, one of the major programming languages on and off the web. In 2018 Guido retired as Benevolent Dictator For Life ("BDFL"), a title seemingly from a Monty Python skit. He is now Emeritus BDFL and happily sits on the Python Steering Council, a five-person group that will give guidance to the future roadmap of the Python programming language. He moved from the Netherlands to the USA in 1995, where he met his wife. Until July 2003 they lived in the northern Virginia suburbs of Washington, DC with their son Orlijn, who was born in 2001. They then moved to Silicon Valley where Guido worked for for a variety of companies including Google and Dropbox (spending 50% of his time on Python!). Guido's home on the web is http://www.python.org/~guido/.